On Friday, May 4th we were up around 6:30 and I was pleased that the sore muscles in my back had pretty much eased. I dislike taking pain medication to be mobile but found it was necessary yesterday at least. We had our coffee and tea together and did some reading on our laptops. We talked about the day’s plans and of course, as always, discussed the weather for the next couple of days. Today, we are looking at some rain, clouds, high winds but a high of 23C/72F and then a nice sunny Saturday. I want to make a couple of snacks for our clothing exchange tomorrow although now that we have received some disappointing responses from the London gang, we won’t need as much to eat. Seems like many of our guests are dropping off like flies so the turn out will be small. We will still enjoy ourselves and the company of others in attendance. I suggested to one of the girls that we need to hold another exchange up here in the fall so they can all make it. Besides Bill won’t mind if there is food leftover for me to bring home! Bill wanted to replace the tube in our tractor tire as well as a couple of other jobs that were on his list. Anyway, he will find things to busy himself. I also have a job to finish down the lane, even if it just means moving the snipped brush cuttings off more to the side. Picking up wet trimmings doesn’t sound too pleasant but Black Beauty has a tight squeeze getting through the way it is. If it clears, I'll get out there. First, I boiled 8 eggs for devilled eggs and while they were cooling, I began making the chocolate macaroons that turned out so well last time. The recipe makes 4 or 5 dozen! Holy moly! I cut back to the lesser quantities and it still made 60 cookies. They are in the fridge to harden. I’ll only take a portion tomorrow. Okay, now to finish the eggs. Today, I had the worst time peeling the darn things. Grrr! Sometimes they peel easily and others it is a fight and they end up all scarred. I’ve heard and read all the tricks and tips: not to use fresh eggs, peel them cold, peel them warm, blah blah blah. I can’t help it if the eggs are too fresh, they are all I’ve got in the fridge! So, I finally completed 16 little ‘devils’ and at least they will taste good. That is the only consolation, no matter what their boats look like. They look like little boats before I fill them. With everything cleaned up, at 10 I took Bill a coffee and asked when to start breakfast. At 10:30 we were eating bacon and eggs and cleaned up the dishes soon after. Bill called H.H. to see if our rain barrel had arrived on the delivery truck today and it had so he drove into Durham with the truck. After he left, I put my gloves on and took my wagon down the lane and gathered the branches and long twigs. It took 3 trips but now all that is left are the wet leaves I raked up. I’ll get those once it stops raining and dries them out. The rain had stopped and the sun made a few appearances. Bill returned and put the spigots/taps in our new flat rain barrel. It’s a beaut! I took a couple of pictures of that and then of my daffodils in full bloom and tulips in the shovel on the hill. This is the best part about spring, watching stuff I’ve planted come to life. Oh! Guess who I saw! I was so excited to see Yert Jr. when I was picking up the twigs! He wasn’t more than 3” long and just adorable. So, this means they are starting to move and our signs will now remind us to go slow. I came inside and worked on colouring my gray roots. Yeuch. Now with the short hair, they are more visible. May as well get that taken care of on a day like this. The wind has picked up and although it is still looking bright out there, the rain and the sun are fighting in the sky. At least it isn’t a wash out, yet. Bill closed up the shed after a 1 minute downpour and came inside. Then it stopped and started and so on for the remainder of the day. But it remained very warm. When at 1 pm we noticed the mail-lady stopping at our box, Bill chanced it and walked down to retrieve it while I hopped in the shower to rinse my hair.. Clemson went out but dawdled so much that Bill was almost down and back before he got to the gravel. The mail was not what we were expecting so we made contact once more with Al at Ford. This is getting ridiculous. The next project Bill wanted to tackle was the replacement lock mechanism for our front door. Peggy had ordered it for us when we were in London and we were lucky that it was covered under warranty and we didn’t have to pay a dime. It will be nice to have a combination lock again and even better to have a remote! While he set to doing that, I started preparing meat loaf for supper. Another inside meal but one that we love. Bill finished the door lock but it wasn’t easy fighting the wind as he tried to attach the lock. The wind was so strong the door had to be held intact as he worked. At least the rain continued to remain at bay. By 3 pm we felt we were full in the throes of the front moving through mid-western Ontario. Up here on the Ridge puts us in a prime target position but to our benefit the winds were southwesterly, hitting the Suite from the nose. We were certainly rocking a lot and it got scary. For a couple of hours, we felt concerned especially after hearing a crash outside and seeing our patio table and chairs had completely toppled over. 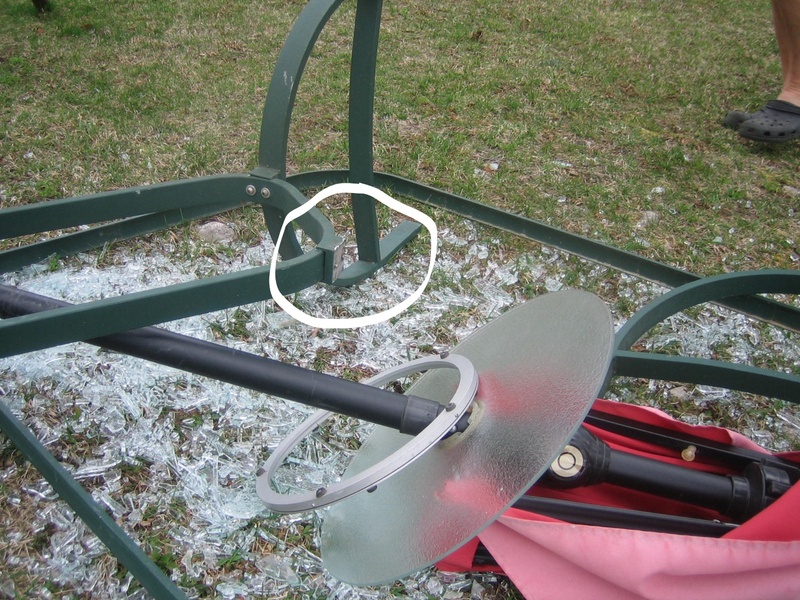 That is the second (and last) glass top patio table that has shattered on us. What a mess that will be to clean up. The umbrella went with it, of course, landing on my bird bath and breaking the solar light at the peak. Two of our patio chairs are over the hill and caught up in the trees, so at least not in the pond. Looking for the silver lining here. By 4:30 things seemed a bit calmer but rain started lightly and as soon as we think things are better, the wind switches and by 5:15 it is belting in gusts now from the northwest corner. It could be an interesting evening. I can only hope our power remains so I can cook supper. I knew there was a reason to plan an inside meal and at 5:30 I decided to take a chance and pop the meatloaf in the oven. The outdoor temperature dropped from 72F/22C to a chill 42F/5C in a two-hour period. I peeled some potatoes and will cook corn for Bill and cauliflower for me. I’m getting hungry just thinking about it. When the convection oven beeped at completion, I had the potatoes mashed but the meatloaf was not quite done. Another 15 minutes at a higher temperature did the trick and it was a very comforting meal. We cleaned up the dishes and out the window, I could see lighter skies on the horizon to the west. That shows promise for tomorrow as does the forecast. Fingers crossed. Thinking of the cleanup outside tomorrow morning, we settled into a quiet evening. I’m happy the wind has let up some (which should be quoted as ‘let down’, don’t you think?) as we should both be able to sleep without a worry. I know the wind storm has been prominent everywhere today so by no means do I mean to imply we are the only ones battling the gusts. We hope everyone is doing okay in your area and have experienced no personal upset because of it. I love that you have stopped in today and I do love hearing from you. Please feel free to drop a line, I will read and respond as time allows. I opted for a metal patio table. That must have been some wind!!! My egg trick - when done, dump hot water and fill with cold, letting cold water run into pot while you peel. The cold water creates steam moisture under the shell and they peel perfectly. Your dinner looks delicious!! Well, thanks for the tip with the eggs but that is almost what I did. Drained hot water, filled with cold, then drained again because it got hot immediately and filled with cold again. I didn't let the tap run. I'll add ice next time as per George's suggestion too. I was so frustrated and it took forever! Ha ha, small things, eh? Into the same egg trick as Nancy and works for me as well Ice water is even better. Gonna be a chore to get all that broken glass our of the lawn. One silver lining is that you guys didn't end up in Kansas! Glad to hear that you are safe! Wow..that was quite the windstorm..Dinner looked awesome, love meatloaf and your looked really tasty! The lock is really cool, no keys! That rain barrel is just adorable, I haven't seen one like that! Too bad the clothing exchange is going to be small, but hoping you enjoy and come home with some "new" clothes! Thinking food and a glass of wine will make the afternoon enjoyable and just seeing sisters and friends too!! We survived the wind and didn't have to dig our toes into the carpet too much! We had a good afternoon at the exchange as you've seen in more a recent post. Oh my, what a mess. Sorry that you will have to deal with it. Patsy are you the one who mentioned in a link a post on Mr Ed's blog re artificial sweeteners? If so can you please send me and email. Contessa, here is the link. Glad you folks managed to stay put. Wind has been an issue everywhere in southern Ontario I think. Too bad about the table but at least the chairs didn't end up in the pond. Love the signs of spring at The Ridge. The wind damage is evident all over and we are still one of the lucky ones. Glad that you did not have too much damage. We had no damage other than a whole lot of branches and twigs impaling themselves into the lawn.. We had pulled the small trailer away from one big tree that is threatening to fall. But... we are coming up for 48 hours without electricity and our trusty little generator has been keeping us powered up and the small trailer is staying charged using our little solar panel. Love the things that boondocking taught us. Glad you also survived without damage but too bad about your electricity. Hope it is back on today for you. You are right, boondocking did teach us to live in those conditions!